At times it’s not easy being green, but on occasion it’s as simple as falling off a log from a sustainable forest. For example, take a straightforward task such as turning down a thermostat. Reducing the temperature in the home by just one degree Celsius will cut 10 per cent off heating bills – an average saving of around £40 per year – and reduce harmful carbon dioxide emissions that contribute to global warming. Of course, just how low the thermostat is set is a matter of personal choice. What some consider comfortably cool, others will find a bit too chilly. Start by reducing the temperature by one degree for a week and wearing another layer of clothes. If the home is still cosy, try dropping the temperature another degree the next week. A bonus is that, in lower temperatures, the human body will burn a few more calories to keep warm, so lower thermostat settings can lead to weight loss and improved general health. With a little bit of thought, the thermostat can be used at different times throughout the week to save energy and cut greenhouse gases. If the house is empty during the day, turn down the thermostat. Do the same if everyone is going out in the evening. There is a common misconception that turning down the thermostat for only a few hours is not worthwhile because more energy is then needed to get the home back up to the desired temperature. This is not so. The truth is that turning the thermostat down will save money and fuel because the central heating will not have to keep the home as warm while everyone is out. It will use less energy overall, even though the heating has to then warm up the home from a cooler temperature. When going away for a weekend or on holiday, lower the thermostat to 12 degrees Celsius. That will save energy without the risk of returning to frozen water pipes. A bonus is that a little extra will be saved on the refrigerator and freezer, as they will not need to work so hard to stay cool. The thermostat can be turned down a few degrees overnight and turned up again in the morning. This can cut between five and 10 per cent off heating bills. Try to delay an hour or two before turning the thermostat back up in the morning to save even more. The number of people in a home can affect the temperature too, as each person is the equivalent of a 175-watt heater. 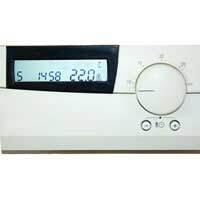 So when throwing a party, turn the thermostat down as a large group of people will warm up the home without the heating. It is easy to forget to turn the thermostat up and down when leading a busy life, so it is wise to invest in a programmable thermostat, which will allow different temperatures to be set throughout the week. Also consider thermostatic radiator valves, which allow the temperature in individual rooms to be controlled. If rooms are not in use, turn down the heat to save energy. Make sure the home is properly insulated, so that heat is not being wasted, and when opening windows for some fresh air in the spring, remember to turn down the thermostat or energy and money will just float out the window.